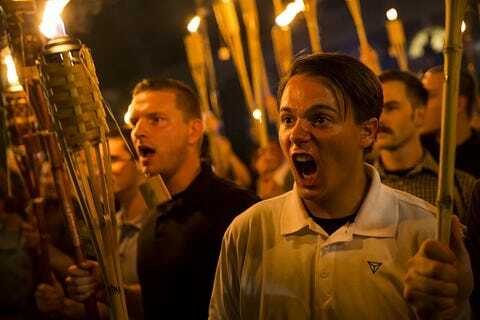 The country has been in shock as backlash has erupted over the recent events that took place in Charlottesville, Virginia just two weeks ago. A group of nationalist protesters took to the streets waving Confederate flags and chanting Nazi slogans such as “blood and soil” and “Jews will not replace us.” The demonstration was met with immense opposition from counter-protesters, and the debate turned violent after a nationalist protester drove a car into a group of rally-goers. On a recent episode of All Things Legal, Craig Ashton and Edward Schade discussed this incident and the consequences of free speech. With social media usage at an all-time high, many people took to Twitter to express their dismay with the Neo-Nazi and white supremacist protesters. One Twitter account even went as far as to post photographs of protesters with hopes of exposing their identities for the world to see. Two protestors were publicly named, and their involvement had serious consequences on their personal and professional lives. Peter Cvjetanovic, a 4th-year student at University of Nevada, Reno, was the subject of one of the photographs posted on Twitter. In the photo, Cvjetanovic is seen at the white supremacist rally, holding a torch into the air and shouting angrily. The students at UNR were outraged after the photo went viral, calling for Cvjetanovic’s expulsion from the school in a petition with over 36,000 supporters. The university acted by making a public statement against the actions of the white supremacist protestors but had no legal grounds to expel Cvjetanovic, as his actions were protected under the first amendment. While he could not be held accountable for his participation by the administration of the public university, he will surely be a target of public scrutiny by his peers at UNR this fall. Cole White was another exposed on Twitter for his participation as a white supremacist protester. It did not take long for White’s employer to be informed of this information and Top Dog, a hot dog restaurant in Berkeley, California, ultimately let him go. Private businesses, such as Top Dog, do not have the same obligations as public universities and may terminate employment for any ethical differences that do not match their company’s beliefs and morals. Top Dog made a statement last week stating, “We do respect our employees’ right to their opinion. They are free to make their own choices but must accept the responsibilities of those choices” (Orenstein, para. 4, 2017). The first amendment allows for individuals to express their opinions without fear of being prosecuted in a court of law. However, the first amendment cannot protect individuals from the consequences and scrutiny that accompanies those racist and discriminatory actions. Everyone is entitled to their own opinions, but those opinions may come at a price.